Today, we do not only start a new category on our blog, but open a whole new chapter of our life. As much we enjoy the advantages of living in a great city, our wish to live a primal and conscious life in close touch with nature grew stronger the last years. We leave Berlin again and again, with increased regularity. Even if we tried to fulfil this wish partly in the city, for example with a opulently planted balcony, it can of course never be the same as nature itself. The consequence is a safe haven, far away from all the fuzz: a settler house in Mecklenburg. Built 1948, surrounded by fields, it stands with a barn on a larger than 3000m² piece of land, on which cherry, apple, plum and peach trees grow, and which waits to be cultivated by us. 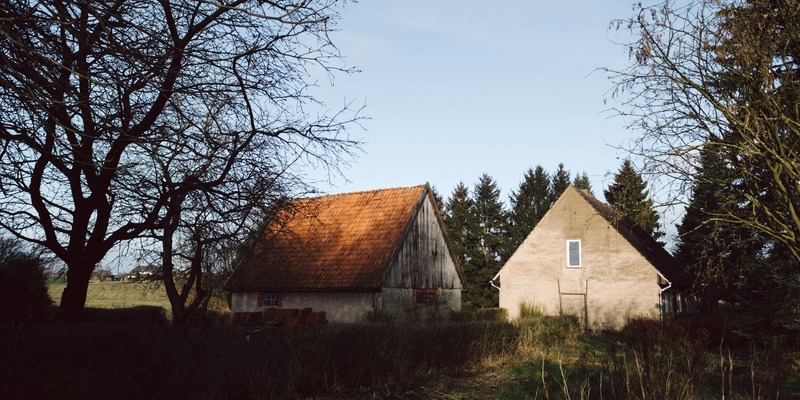 Since country life is not always as romantic as one might imagine now and then, but has a work-intensive daily routine, we are curious how this will change us. All we know is that every time we’ve been into nature before for a few weeks, we found ourselves a bit more. How grounding ordinary things as chopping wood and making fire can be. Man always strives for something higher, for new challenges, wants to achieve something to give meaning to his live and forgets to cherish the simplicity. Is the meaning of life not to just live? Here and now. Do we really have to leave our mark on the world? Don’t we chase an idée fixe which blinds us for the important things in life? Masanobu Fukuoka writes in his book The road back to nature: “In the same extent man detaches himself from nature, he detaches from his centre.” We want to find back to this centre. We want to appreciate the music of nature, the swish of leaves, the rushing of the wind. Feel earth beneath our fingers out of which fruits and vegetables grow. How often did we rack our brains what a seasonal and regional diet actually means to us. Most important has always been to be close to nature again by cooking along the seasons. To support this from our own garden has been a big dream of ours. The planting of our balcony alone changed our appreciation for food. The grasp of the effort, work and especially the necessary knowledge to grow a nutritious fruit out of a seed. All of this was on our minds for a long time and will have its own place on our blog from now on. We want to tell you from our daily life in our garden and share our thoughts and experiences about our settler house with you. We hope you like to join us on our adventure. Liebe “Krautköpfe”, Glückwunsch zu diesem Schritt! Ich habe 45 Jahre in deutschen Großstädten verbracht und bin dann zu meiner jetzigen Frau aufs Land gezogen. Hab ich nie breut. Obwohl es viel Arbeit ist. Und wenn ich eure Obstbäume auf dem Foto sehe, weiß ich was ihr noch alles tun müsst ;-) Ich bin mir aber sicher, dass ihr mit eurer Leidenschaft für Natur und Bodenständigkeit genau die Richtigen für so ein Projekt seid. Ich freue mich schon jetzt auf eure Berichte.